You don’t have to live on a small island to discover that winter is a journey. So much for spring. 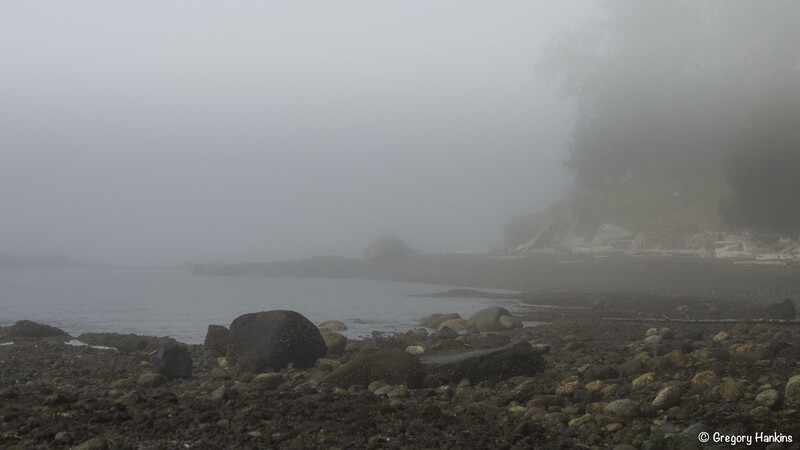 The weather closed in last night, and when we got up this morning, the island was muffled in clouds. We feel disoriented, as if we’ve been set adrift. We love the winter months. The soft greens and greys, and the deep silence. All you can hear is the rain hitting the skylights and the thrum, thrum of a freighter passing somewhere in the fog. It’s a time for solitude and reflection. For allowing your mind to settle and your brain parts to stop randomly jumping around. Besides, there isn’t a lot to do on a small island in the winter. We’re experts at cocooning. My husband makes lattes and brings them into the sunroom. I’ve already made a nest on the love seat. There’s a fire in the wood stove, and we settle in. I love the word repose. It means to remain still. There’s something graceful about repose. Unlike rest, which is something you do after surgery or childbirth. Rest often means taking a break. Breaks are sharp-edged and grudging, taken with one eye on your watch. What happens at a meeting when someone says, “Let’s take a break”? Do people meditate, do yoga, or go stand under a tree? Do they talk to one another, listen, make eye contact? No, they take out their cell phones. Most of the time, you take a break from doing one thing in order to do several other things for five minutes. It’s hard to find rest during a break. Repose also means resting, but resting in stillness. The mind chatter gradually ceases. The knots loosen. All the jumpy circuitry stops firing every 3 seconds, and your brain waves slow to smooth swells. Your mind is like a settling pond. When you are still, the mental garbage — which means most of what’s swirling around in your head — sinks to the bottom. The pond clears. What’s important can then start rising to the surface. Things your mind may have forgotten but your heart has not. You can’t do this while multi-tasking. That’s why periods of repose are necessary. What are you doing with your one irreplaceable life? How are you spending your precious time? There would be fewer divorces and mid-life crises if people sat still once in awhile. Wintering here isn’t for everyone. If you hate the rain and the days when it gets dark by four o’clock, you’re better off in Mexico or Arizona. If you stay here, you’ll probably start drinking. A lot of people pack up after Christmas and leave for 3 months. The island seems deserted. But if you stay, along with the storms and power outages, you may find a poet, or an artist, or a pilgrim inside you. Of course, you don’t have to be on an island to do this. You can be anywhere and and discover that winter is a journey. This entry was posted in Humour, Inspiration and tagged fog, gulf islands, humour, island life, reflections, repose, stillness, west coast, winter by susanlhamilton. Bookmark the permalink. Such a calming piece, Susan…I’m going to try visualizing all of the sounds and sights in your Repose during middle-of-the-night wakefulness. And Greg’s photograph captures island winter days like yesterday, days ideal for cocooning.